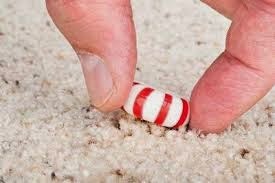 Direct Cleaners Ltd: If you dropped your favourite sweet or biscuit on your living room carpet, would you pick it up & eat it? Fact: 80% of men surveyed would eat their favourite biscuit if they dropped on their lounge carpet & 60% of women! If you dropped your favourite biscuit on the pavement in Piccadilly Circus, would you pick it up & eat it? In a survey only 1% of people said they pick up their favourite biscuit & eat it if they dropped it in Piccadilly Circus! This survey showed that the average 2 year old carpet has 5 Times more dirt and particular in it, than the streets of Piccadilly Circus. So What's Found in Carpets? These are all study's by Insect Research & Cambridge University. Pollen Grains - These can trigger Hay Fever in the Spring & Summer. Mammal Hair. Which includes (Human, Cat, Dog, Rat & Mice). 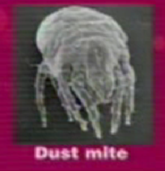 Dust Mite Allergen - The Main Trigger for Asthma & Most Allergies. That's not all. After 2 years, an un-cleaned carpet will weigh 2LB's heavier per sq-mtr. The sad fact is 90% of Britain's will never get their carpets cleaned. But… before you go and rip-out your carpets consider this. Think of your carpet as a giant Air Filter for the room. Because that's what it is. · We breath about 50 lb's of air every day. About enough to fill 3 average size rooms. This air we breathe carries much of the pollutants stated above. Especially the harmful ones like Pollen Grains & Dust Mite Allergens. Here’s the good news… When the air circulates around the room, the pollutants get trapped in the carpet and stays there. On hard floors, the pollutants hit the floor and bounce back up into the air that we are breathing. So if these pollutants are not filtered out by your carpets, where do they go? Cleaning a carpet, is proven to remove Pollen Grains, Dust Mite Allergens and most of what is found in the carpet. Like any filter, it needs to be cleaned or replaced. The carpet & Rug Institute recommend carpet cleaning every 6 months. People with children who suffer from asthma have been ripping out their carpets. The hard floor industry has had a really good PR over recent years. It has made them a fortune. People, started removing their carpets & did find the asthma improved for a short while. Not only did the asthma come back, it got worse!!! They didn't replace the giant air filter (the carpet). All they needed to do was get it cleaned. Probably saving about £900. · About 10% of the population suffer from Asthma. For 70% of the asthma sufferers the cause is Dust Mite Allergens. Most Dust Mites, (about 80%) are found in Mattresses & Pillows. The rest are found in your carpets. When we sleep, we all shed approximately 1gram of skin per week in our beds, (Which is the dust mites favourite food) and we, produce about a pint of water of sweat per night. This is the perfect living conditions for the dust mite. The best way of getting rid of dust mites from your mattress is to have it cleaned about once per year, vacuum about once a month and ‘air’ the mattress everyday..
We can also apply a treatment that will completely eliminate Dust Mites for up-to 18 months, in carpets & mattresses. Carpets act like air filters & should be cleaned 1-2 times per years. Don't just clean your carpet for visual reasons. Clean them for health & Hygiene reasons as well, because you never know when you might drop your favourite biscuit. What have you dropped onto your carpet only to pick it up, give it a wipe and eat it? Let me know in the comments box below. Mick always does a great job cleaning our carpets. He is conscientious, honest and I like his positive attitude - nothing too much trouble. Thank you so much, carpets look great!! Totally reliable service from booking to completion of the cleaning. Efficient and clean service with minimal disruption.